After all, identifying your life’s purpose and through it, being able to make a positive impact on the world around you,” Dr. Walker often says, “is what life is really about! 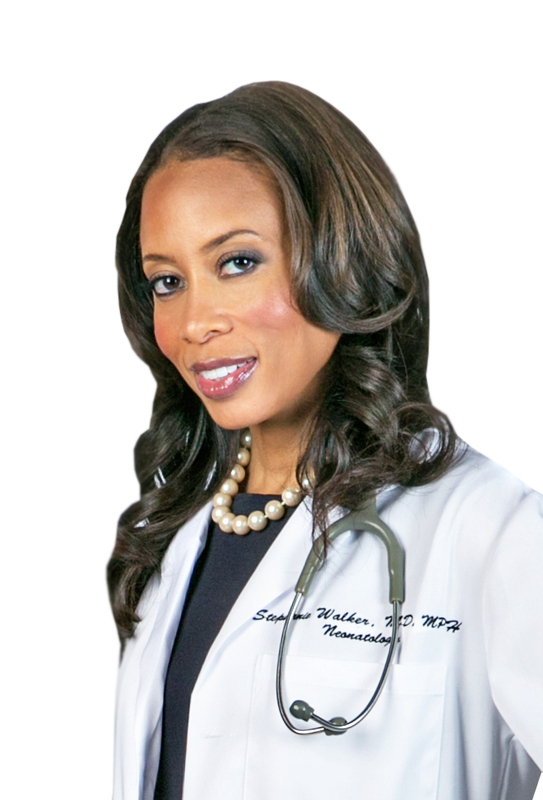 Dr. Stephaine Hale Walker, a native of Los Angeles, California, received her Bachelor of Science degree from Vanderbilt University in 1997 and her medical degree from Cornell University Medical College in 2001. She completed her residency in Pediatrics at the Children’s Hospital of Philadelphia in 2004, and a fellowship in Neonatal-Perinatal Medicine at the Children’s Hospital of Los Angeles in 2006. Afterwards, while a Harvard University Commonwealth Fund Fellow in Minority Health Policy, she completed a Master of Public Health degree with a concentration in Health Policy and Management at the Harvard School of Public Health in 2007. That same year she was also the recipient of the Presidential Scholar Award at Harvard University. Upon completing her fellowships, Dr. Walker joined the Harvard Medical Faculty Physician group as a Neonatologist at Beth Israel Deaconess Medical Center [BIDMC] and an Instructor of Pediatrics at Harvard Medical School in the Department of Pediatrics. In May of 2009, she married Bishop Joseph Warren Walker. Upon moving to Nashville, Dr. Walker joined the Neonatology faculty at Monroe Carell Jr. Children’s Hospital at Vanderbilt University, as an Assistant Professor of Clinical Pediatrics in the Department of Pediatrics. They are the proud parents of a two beautiful children, Jovanni and Joseph IV. She and her husband have collaborated with other visionaries in the Nashville community who share her passion for health policy, health disparities and community action to seek solutions and to improve the access to and utilization of health-related resources. Believing that finding one’s calling is about making the community in which you live better, she launched Full Circle Health Community Coalition in early 2010 to bridge the gap and bring together diverse partners to improve the health of those living in underserved communities. In 2010, Dr. Walker, alongside her husband, founded the non-profit the Drs. Joseph & Stephaine Walker Foundation. The mission of the foundation is now primarily advanced through scholarships for students, mentorship and community outreach. The Walkers are committed to helping people help themselves and those in the world around them lead productive and satisfying lives. Targeting obesity and health literacy, in January of 2011, Dr. Walker helped lead the establishment of ChurchFIT, a Mt. Zion fitness and health awareness program. ChurchFIT was revealed by Mt. Zion Baptist Church in partnership with Full Circle to help the church’s 30,000 plus congregation revive fitness goals and maintain a healthy lifestyle to promote and improve overall health and wellness. In 2013, Dr. Walker was appointed Overseer of the Mt. Zion Health Care Ministry. Most recently Dr. Walker was appointed to Overseer of Health and Wellness for the Full Gospel Baptist Church Fellowship, where her husband serves as International Presiding Bishop. In 2016, Dr. Walker launched ChurchFIT International and now it has become a model and resource for congregations around the world. In 2015, she joined forces with Beautycounter, becoming a healthy beauty advocate, helping educate and empower women and families in underrepresented communities to make healthier choices regarding the personal care products they choose to use in their homes in order to help mitigate the health disparities we frequently see in these communities. For more information visit: Beautycounter.com/stephwalker. In 2017, Dr. Walker retired from clinical practice in order to focus more heavily on developing programs and resources to impact the health of individuals within the faith-based communities nationwide, given her unique role as a Physician and a First Lady. Her record of volunteerism spans the country, from mentoring teenage girls interested in health sciences in Boston, mentoring pregnant teens at Inwood House in New York, teaching STD/AIDS educational programs to youth in Philadelphia and New York City schools, and mentoring teens and young adults in Nashville in the “Lifting as We Climb” Program, just to name a few. In addition, she has and continues to mentor numerous undergraduate and graduate students, as well as medical, residents and fellows as they move about the country pursuing their careers. Dr. Walker currently serves on the Board of Directors for the Community Foundation of Middle Tennessee, as well as the Board of Directors for former Senator Bill Frist’s NashvilleHealth initiative.. Dr. Walker, also co-authored a best selling book with her husband entitled “Becoming a Couple of Destiny”, which chronicles lessons of life balance and transparency in marriage. She is a bridge-builder, advocate, entrepreneur and caregiver. As Mt. Zion’s First Lady, Dr. Stephaine—as she is fondly called — is guided by the life philosophy that “to whomsoever much is given, much is required…”(Luke 14:48). In May 2009, she married Bishop Joseph Warren Walker. They are the proud parents of a beautiful daughter. She and her husband have collaborated with other visionaries in the Nashville community who share her passion for health policy, health disparities and community action to seek solutions and to improve the access to and utilization of health-related resources. Believing that finding one’s calling is about making the community in which you live better, she launched Full Circle Health Community Coalition in early 2010 to bridge the gap and bring together diverse partners to improve the health of those living in underserved communities. Targeting obesity and health literacy, in January of 2011, Dr. Walker helped lead the establishment of ChurchFIT, a Mt. Zion fitness and health awareness program. ChurchFIT was revealed by Mt. Zion Baptist Church in partnership with Full Circle to help the church’s 30,000 plus congregation revive fitness goals and maintain a healthy lifestyle to promote and improve overall health and wellness. In 2013, Dr. Walker was appointed Overseer of the Mt. Zion Health Care Ministry. Most recently Dr. Walker was appointed to Overseer of Health and Wellness for the Full Gospel Baptist Church Fellowship where her husband serves as International Presiding Bishop. In 2016, Dr. Walker launched ChurchFIT International and now it has become a model and resource for congregations around the world. Her record of volunteerism spans the country, from mentoring teenage girls interested in health sciences in Boston, mentoring pregnant teens at Inwood House in New York, and teaching STD/AIDS educational programs to youth in Philadelphia and New York City schools, just name a few. Dr. Walker mentors teens and young adults in Nashville in the “Lifting as We Climb” Program. In addition, she has and continues to mentor numerous undergraduate and graduate students, as well as medical, residents and fellows as they move about the country pursuing their careers. Dr. Walker currently serves on the Board of Directors for the Community Foundation of Middle Tennessee, as well as the Board of Directors for former Senator Bill Frist’s NashvilleHealth initiative. She also serves on the Community Marketing and Outreach Council for the Frist Center for Visual Arts. Dr. Walker, also co-authored a best selling book with her husband entitled “Becoming a Couple of Destiny” which chronicles lessons of life balance and transparency in marriage.